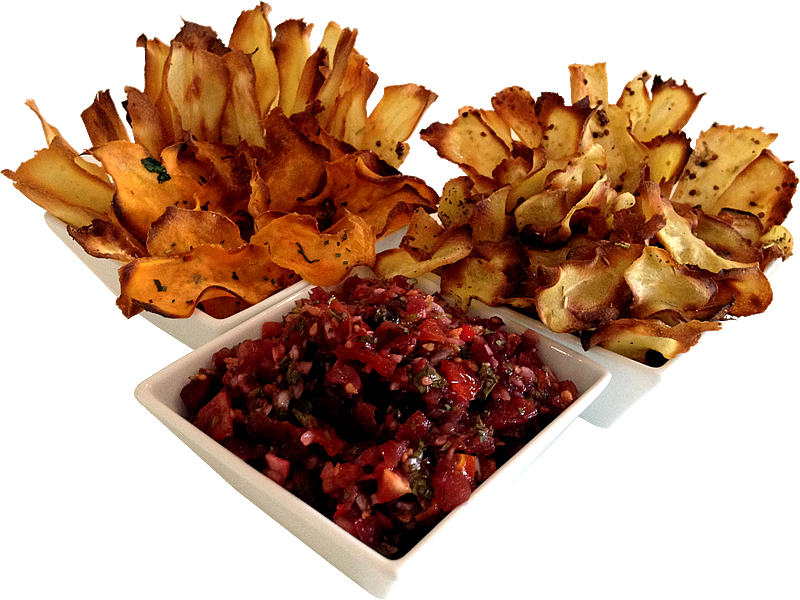 These crispy chips are a tasty and healthier alternative to potato chips. Parsnips are rich in several health-benefiting phyto-nutrients, vitamins and fibre. In addition, they boast healthy levels of minerals like iron, calcium, copper, potassium, manganese and phosphorus. If you can’t find parsnips locally, this recipe also works great with sweet potatoes, swede and turnips. All of these are much healthier choices than those mega bags of potato or corn tortilla chips. This recipe ideally requires a handheld vegetable peeler to create thin strips along the length of the parsnips. But equally you could use a mandolin or food processing attachment. If you really don’t have anything like this, you can get close with a sharp knife and a steady hand – just allow a little more time and experimentation on baking times. I have created an infographic on Pinterest to illustrate how to cut these chips. Use your cutting aid of choice to cut the parsnip into the thinnest possible strips. Place the strips in a bowl and add 1Tbsp of oil. Get your fingers in there and make sure the oil is evenly coating them. Place the strips on the parchment paper-lined baking sheet and sprinkle some salt over them. Sprinkle on any herbs you are using too. Place on the middle shelf of the oven and check them at 6 minutes cooking time. They should be just starting to brown on the edges. Remove from the oven, flip over each strip and return to the oven for approx. another 6 minutes. You can swap the oil for toasted sesame oil for an oriental flavour. Add a tsp of wholegrain mustard, which goes really well with the sweetness of the parsnip. Perfect for dipping into home-made salsa, guacamole or sour cream dips. These are best made on the day of eating to retain maximum crispiness, but they do keep well for 24 hours in a sealed container. Make sure they are completely cooled before storing.